Two main central Coats of Arms, each 6500mm wide x 6750mm high x 500mm thick, were manufactured in GRP and assembled in 16 component parts at our factory. 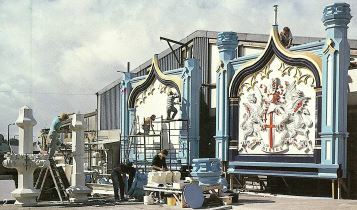 The Coats of Arms are amongst the largest one-piece GRP mouldings ever to be transported by road. 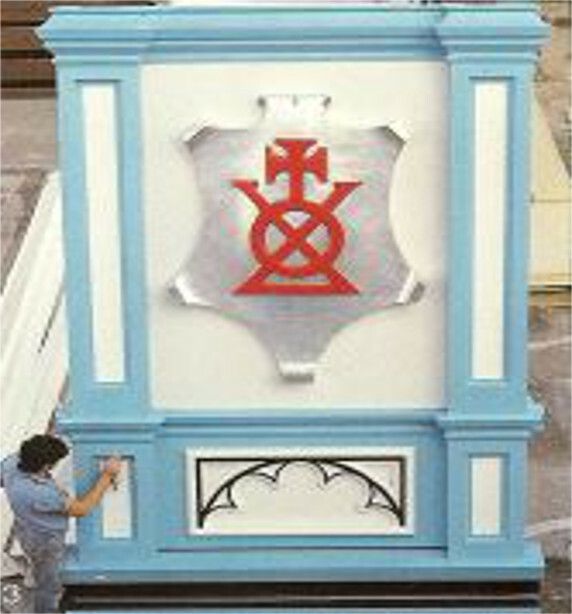 The rear of each Coat of Arms is clad with moulded panels and came complete with matching balcony belows. Inside both Coat of Arms is a steel frame fabricated from 150mm steel joists encapsulated in GRP. Steel rails were fastened to this main frame and dressed with highly decorative and moulded GRP sections, each incorporating integral colours of white, blue, black, and gold. In 1947 the original cast iron Coat of Arms were removed from the bridge at the same time as the cast iron walkway balcony panels. 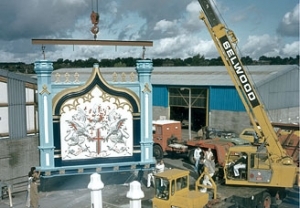 The Coat of Arms and panels, which had suffered general deteriation, were preventing maintenance being carried out on the rusting bridge structure behind and therefore had to be taken down. 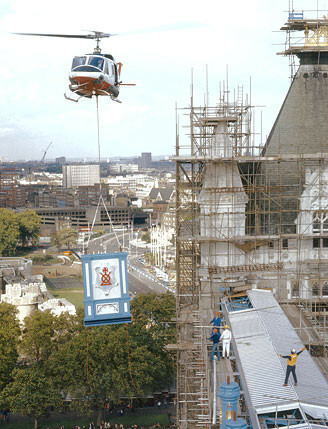 Restoration of all four sides of both high level walkway balconies was a major part of the £3.4m modernisation contract for the Tower Bridge. 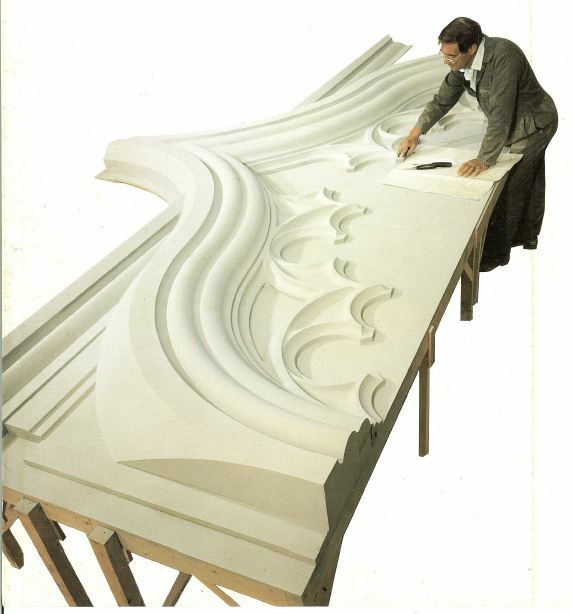 GRP was used to reproduce the original cast iron balcony panels which had been removed in 1947. Originally the cast iron dado panelling was bolted to the outer face of the latice walkway girders. Cast iron grilles above provided light and ventilation to the interior of the walkway. Over the years rainwater penetrating the joints in the panelling caused serious rusting to the lower members of the lattice griders which, because of the walkway balcony panels, proved inaccessible for carrying out maintenance work of any kind. 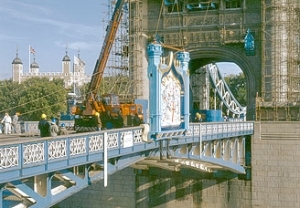 Removal of the cast iron panelling relieved the bridge of 400 tons of dead weight. The best way to restoring the external appearance of the walkways without recreating the constructional problems was to fix GRP cladding clear of the structure by forming a maintenance walkway between it and the outer face of the lattice. For architectural reasons the glazing which provides security and weather protection to the walkways, has been fixed on the inner face of the lattice girders.